RAD’s Airmux-400 series of point-to-point broadband wireless radios deliver native Ethernet and TDM services over a single wireless link in various sub-6 GHz frequencies. With a flexible combination of Ethernet and up to 16 E1/T1 interfaces, the high capacity Airmux-400 radio systems provide aggregated throughput of up to 750 Mbps and a range of up to 120 km (75 miles). The Airmux-400 radio systems incorporate advanced features, such as MIMO, OFDM and high modulation schemes. Furthermore, unique air interface capabilities ensure optimal performance and high spectral efficiency in dense radio environments and multipath conditions. 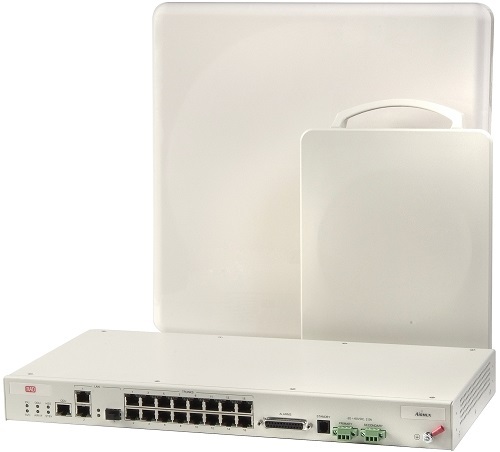 Airmux-400 products comply with worldwide regulations and standards and are deployed globally by leading service providers, as well as operators of public and private networks requiring high-capacity connectivity.